Uric acid is a purine metabolic waste substances from the food consumed. It also includes a byproduct of the breakdown of cells in the blood. whereas purine substance was found in any food that comes from living bodies. In other words, the living body of the presence of purines. because human beings take it, then move to the purine substances in the body manusi. Purine also resulted from the destruction of body cells that occurs normally or because of certain diseases. Normally, uric acid will be released in the body through the stool (feces) and urine. However, because the kidneys are unable to remove uric acid that is then led to increased levels in the body. Excess uric acid will then accumulate in the joints causing pain or swelling. 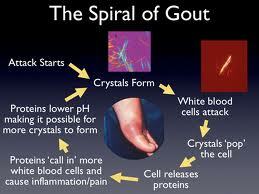 Patients with gout are usually characterized by the frequent experience tingling, aching pain or joint pain sudden. Usually it affects one joint and more initial attack began on the leg joints. Most first attacks occurred at night before morning. Pain can also occur on the ankles, knees, fingers or other joints. Besides other signs and symptoms are affected joints terihat gout swelling, redness, heat and pain was incredible.